Army patrols and tanks locked down the capital of Bahrain after riot police swinging clubs and firing tear gas smashed into demonstrators, many of them sleeping, in a pre-dawn assault Thursday that uprooted their protest camp demanding political change. Medical officials said four people were killed. Hours after the attack on Manama's main Pearl Square, the military announced a ban on gatherings, saying on state TV that it had "key parts" of the capital under its control. After several days of holding back, the island nation's Sunni rulers unleashed a heavy crackdown, trying to stamp out the first anti-government upheaval to reach the Arab states of the Gulf since the uprisings in Tunisia and Egypt. The move was a sign of how deeply the Sunni monarchy - and other Arab regimes in the Gulf - fear the repercussions of a prolonged wave of protests, led by members of the country's Shiite majority. Tiny Bahrain is a pillar of Washington's military framework in the region. It hosts the US Navy's 5th Fleet, which is a critical counterbalance to Iran. Bahrain's rulers and their Arab allies depict any sign of unrest among their Shiite populations as a move by neighboring Shiite-majority Iran to expand its clout in the region. But the assault may only further enflame protesters. In the wake of the bloodshed, angry demonstrators chanted "the regime must go" and burned pictures of King Hamad bin Isa Al Khalifa outside the emergency ward at Salmaniyah hospital, the main state medical facility. The hospital was thrown into chaos by a stream of dozens of wounded from Pearl Square with gaping wounds, broken bones and respiratory problems from tear gas. Men and women lay in shock on stretchers, heads bleeding, arms in casts, faces bruised as they were shuttled around by nurses. At the entrance, women wrapped in black robes embraced each other and wept. Bahrain's Health Minister Faisal bin Yaqoob al-Hamer said on Thursday morning 195 of the wounded had left hospital, but 36 were still receiving treatment, including one in intensive care. "It is most unfortunate," he told Reuters at the bedside of a doctor hurt during the clash. The capital Manama was effectively shut down Thursday. For the first time in the crisis, tanks and military checkpoints were deployed in the streets and army patrols circulated. 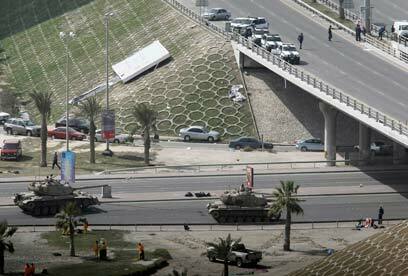 The Interior Ministry warned Bahrainis to stay off the streets. Banks and other key institutions did not open, and workers stayed home, unable or to afraid to pass through checkpoints to get to their jobs. US Secretary of State Hillary Clinton telephoned her Bahraini counterpart on Thursday to express deep concern after the violent raid, the State Department said. "She expressed deep concern about recent events and urged restraint moving forward. They discussed political and economic reform efforts to respond to the citizens of Bahrain," a senior State Department official, speaking on condition of anonymity, said. UN Secretary-General Ban Ki-moon joined the demand for restraint, calling on the leaders of Bahrain not to use violence against civilians and journalists. See all talkbacks "Bahrain military locks down capital"